Zach's Lucky Dime is a page that introduces, and promotes gaming as both past-time and recreation. May also be promoting sports and upcoming events. The site also desire to post updates of on-going games such as Lotto results and more. 1. Shuffle and deal a standard 52-card deck until all the cards have been dealt out and each player has 13 cards. 2. Bid (if you are the person to the left of the dealer) on the number of tricks - always between 4 and 13 - you estimate you can win. Bid nil or blind nil if you think you cannot win a single trick in the entire round. 3. Evaluate the first bid of the opposing team. Note the special bids of nil or blind nil. 4. Note your partner's bid; he is making the contract bid for which you are both responsible. 5. Note the bid of the second partner of the opposing team, for which both partners are responsible. 6. Write down all bids. 1. Play your lowest club on the first hand, after the holder of the 2 of clubs has led. Discard a heart or diamond if no club is held. 2. 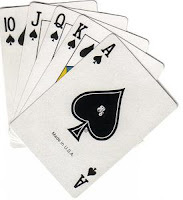 Lead the next trick if you won the first, with any card but a spade. Follow suit, but if unable, play any card including a spade. 3. Play one round or 13 tricks, until all players have no cards remaining in their hands. 1. Score 10 times the bid for the team that took as many tricks as bid, plus one extra point for each additional trick or sandbag. 2. Score 50 points for the successful nil bidder, plus the score won or lost by the partner for tricks made. Score 100 points for the successful blind nil bidder, plus the score won or lost by the partner for tricks made. 3. Deduct 10 points for each trick taken by the team that did not make its bid. Deduct 50 points for the failed nil bid, plus the score won or lost by the partner for tricks made. Deduct 100 points for the failed blind nil bid, plus the score won or lost by the partner for tricks made. 4. End the game when one team reaches 500 points and wins. I am an Outdoor enthusiast and a tech guy. Travel theme. Theme images by pollux. Powered by Blogger.